the data placement strategies and request distribution policies, with the ultimate goal of maximizing the data access locality of Cloud-TM applications. The following figure provides a high level overview of the architecture of the Autonomic Manager (AM), and reports the set of self-tuning mechanisms that it supports. scale of the underlying platform, the number of replicas of each datum stored in the platform, the replication protocol. Mechanisms aimed at optimizing the data access locality of Cloud-TM applications, that is targeted at maximizing the collocation between the application code and the data it accesses. The Workload and Performance Monitor (WPM) is the subsystem in charge of gathering statistical information on the workload and performance/efficiency of the various components/layers of the Cloud-TM Platform, and of conveying them towards the Workload Analyzer (WA) and the Adaptation Manager (AdM). The WA exploits the monitoring-data streams produced by the WPM to automatically detect shifts of the workload that may give raise to QoS violations and/or lead the Cloud-TM Data Platform to operate in suboptimal configurations. This information is exploited, in its turn, by the AdM, which can react triggering corrective actions aimed to alter the scale and/or configuration of the Data Platform. RESERVOIR) that is designed from the grounds up to meet the requirements of large scale, virtualized cloud infrastructures, and represents the backbone data dissemination infrastructure of the Cloud-TM WPM. exposes programmatic APIs and web-based GUIs allowing for aggregating statistics originated by different software layers and/or groups of nodes. Data filtering and workload/KPI change detectors. The WA integrates algorithms aimed at detecting statistically relevant variations of platform’s KPIs and/or workload characteristics. These techniques allow filtering unavoidable statistical fluctuations and enhance the stability and robustness of the self-tuning mechanisms integrated in the Adaptation Manager. Workload and resource demand prediction. The WA includes algorithms for time-series forecasting, which allow predicting future workload’s trends and allow the Adaptation Manager to enact proactive self-tuning schemes. This func- tionality represents a fundamental building block for any proactive adaptation scheme, i.e. schemes triggering reconfigurations of the platform anticipating imminent workloads’ changes, which are particularly desirable in case the platform’s reconfiguration (as in the case of elastic scaling) can have non-negligible latencies. Integration with RHQ and R. Plug-ins have been built to inter-connect the WPM with RHQ, a popular open-source suite for the management and administration of systems deployed on large scale, distributed platforms. This allows benefitting from the advanced graphing, analysis and ruleset-based alert notification mechanisms integrated in RHQ. Further, scripts were also developed showing how to interface RHQ, via its RESTful APIs, with the R  statistical engine. This opens the possibility to run a wide range of time series analysis methods (such as, moving averages, ARIMAX models, Kalman filters) aimed to forecast future trends of the workload fluctuations. The Adaptation Manager (AdM) is the key component of Autonomic Manager, and its actual “brain”. As already mentioned, this module is in charge of driving the self-tuning of a number of mechanisms of the Cloud-TM Data Platform, as well as of automating its QoS-based resource provisioning process (by transparently acquiring/releasing resources from IaaS providers). The following figure depicts the internal architecture of the Adaptation Manager, highlighting its main building blocks and how it interacts with the other modules of the Cloud- TM Platform. 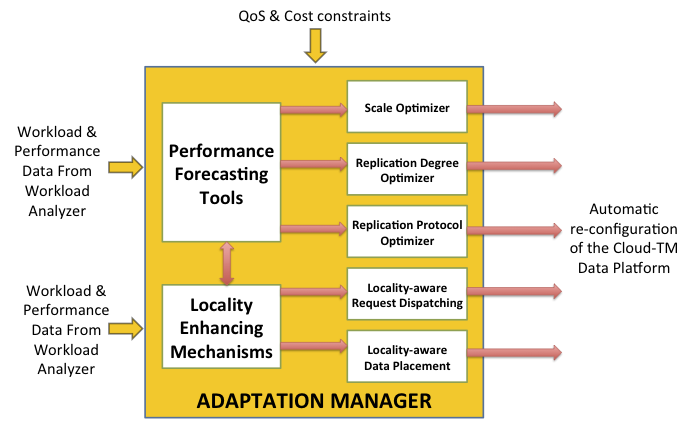 The Adaptation Manager is formed by two main subcomponents, the Performance Prediction Service and the Platform Optimizer. the minimal training phase of white-box methods, and their high extrapolation power, i.e. their ability to achieve good accuracy even when providing forecasts concerning previously unexplored regions of the workloads’ parameter space. on diverse prediction methodologies, which include: analytical methods, machine learning techniques, simulation techniques. This predictor relies on an analytical models (based on queueing theory arguments) to model data contention dynamics. More in detail, the analytical model at the basis of this predictor uses mean-value analysis techniques to forecast the probability of transaction commit, the mean transaction response time, and the maximum system throughput. This allows supporting what-if analysis on parameters like the degree of parallelism (number of nodes) in the system or shifts of workload characteristics, such as changes of the transactions’ data access patterns. One key element of the modeling approach is that it does not rely on classic, strongly limiting assumptions on the uniformity of transaction’s accesses over the whole data-set. Instead, it introduces a powerful abstraction that allows the on-line characterization of the application data access pattern in a lightweight and pragmatical manner, which is called Application Contention Factor (ACF). This predictor is based on Discrete Event Simulation techniques, and includes a set of discrete event models which are able to simulate the behavior of the different operating modes supported by the Cloud-TM Data Platform. The whole architecture of the simulation component is highly modular, since it is based on skeleton models, which allow the instantiation of actual models able to capture the dynamics of differentiated distributed data management schemes, as well as of differentiated platform scales. Also, it is highly configurable, since it offers a suite of different embedded data access models, relying on a wide set of parameterizable distributions, and also offers the possibility to simulate data access patterns based on traces of the accesses, as provided by the tool chain formed by WPM and WA. This predictors relies on pure black-box machine learning techniques to forecast the throughput, abort rate and mean execution time (or its x-th percentile) of the transaction classes composing the input workload. This is a multiple-input-multiple-output (MIMO) regression problem, in which for each of the above parameters, we aim at identifying a corresponding function that captures their dynamics over an input space composed by a rich set of features characterizing the workload and the scale/configuration of the platform. During the project we experimented with several machine-learning techniques, including Artificial Neural Networks, Decision Tree algorithms for regression and classification problems, as well as on-line reinforcement learning algorithms. The prototype of the Cloud-TM Platform ships with a performance predictor based on Cubist, a decision tree regressor that has been widely tested during the project to build performance predictors of various subcomponents of the platform. the policy used to distribute requests among the nodes of the platform.